1. give my wardrobe a makeover. I'm tired of wearing the same stuff, so I'm going to update my whole closet. 2. finish all old scrapbooks. I still have tons from high school and vacations to add to my scrapbooks. 3. travel to two places on my list. I'm thinking Antelope Canyon for one and still trying to decide on the second. 6. build a bookshelf. We have a bookshelf from my great-great-grandma that I've always loved. I'd like to build one that matches. 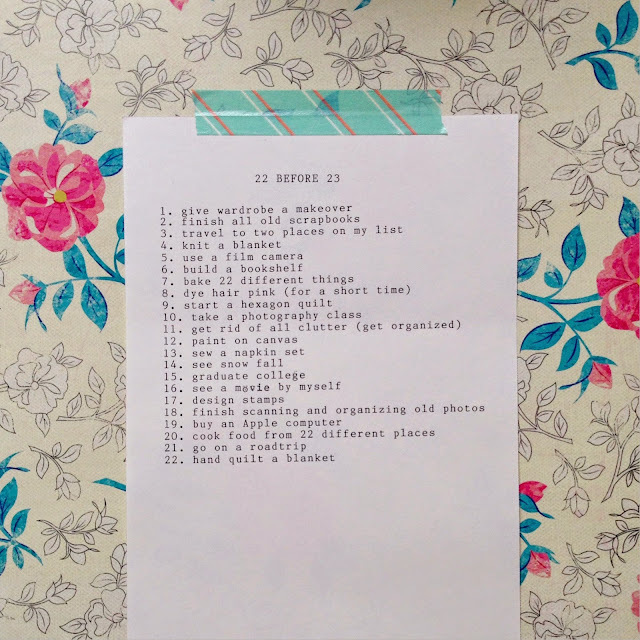 11. get rid of all clutter. Sometimes it feels like I have too much stuff. I want to get rid of a lot and get organized. 16. see a movie by myself. I've always felt too shy to do this, so I'm making it a goal. 22. hand quilt a blanket. I want to make one similar to one my great-grandma, Laura, made many years ago by hand. I'm so excited to try to accomplish another list. Have you done this? What goals to you add to your list? Thanks so much for checking out my list! Ive been having fun with the things on my list, but I still have so much to finish by April!